The band began in 1989 in Westminster, California. After a year of rehearsal and lineup adjustments, the band held a demo release in a living room in Huntington Beach, California with Glycine Max in June 1990. 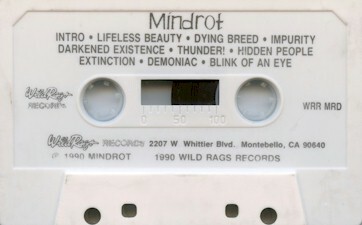 The band next recorded the Endeavor EP and released it through their own label, Tempest Records, following with a split 7" with a band called Apocalypse. In 1992, the first major line-up change came with the addition of long time friend Evan Kilbourne on drums, with whom they recorded Live in the Studio. In late 1992, Faded Dream was recorded, then released by record label Relapse Records. In 1994, another line-up change occurred. Matt Parrillo decided it would be in his best interests to leave the band and pursue his other band Dystopia as well as his graphic arts career. He was replaced by John Flood, another good friend with the band (as well as one of Matt Fisher's former bandmates in Rupture, which went on to become Confrontation). Forlorn was released in 1995, followed by Dawning. Pro made Covers and pro printed cassettes. Covers were semi glossy cardstock, cut and paste style but still pro printed. Included lyrics. Released by Wild Rags. Pro printed covers. Tapes varied.